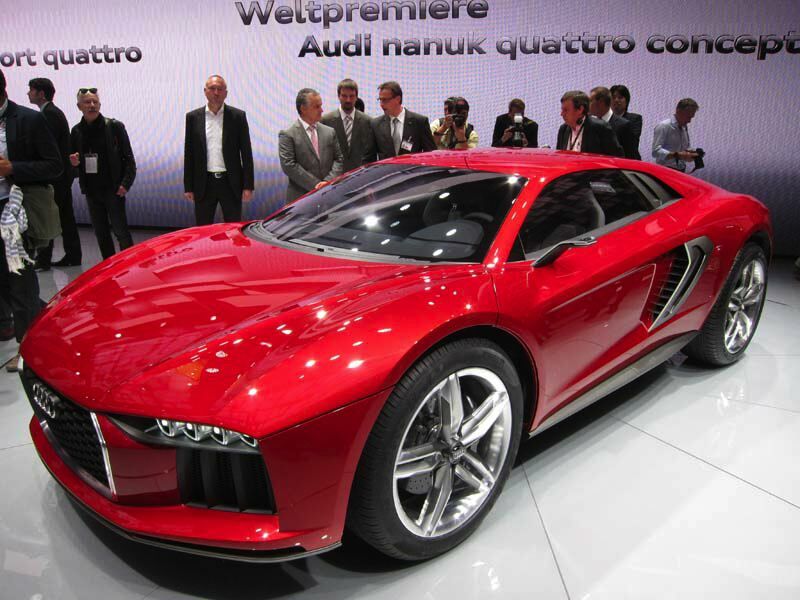 Audi added to its home autoshow buzz by revealing not one but two concept cars at the 2013 Frankfurt Auto Show. The first reveal was a Sport Activity vehicle, dubbed the Nanuk, which was clearly based on the earlier Italdesign Parcour. While the Parcour was fitted with a Lamborghini 5.2L V10 gasoline engine, the Nanuk (Inuit for Eskimo) is fitted with an Audi 5.0L V10 TDI engine. The monster diesel produces 544HP and 738 lb-ft of torque and conveys that massive amount of power to the terrain through a Quattro all wheel drive drivetrain. although weighing 1900 kilos, the massive power output from the V10 TDI gets the Nanuk up to 100 kms/hr in under 4 seconds and top out at 305 kms/hr. Under teh seemingly jacked up sheetmetal, the vehicle rides atop Audi’s adaptive air suspension which can be automatically adjusted using the vehicles onboard navigation system. The system adjusts ride heights some 70mm between a low ride on a highway and being raised up when off-road. 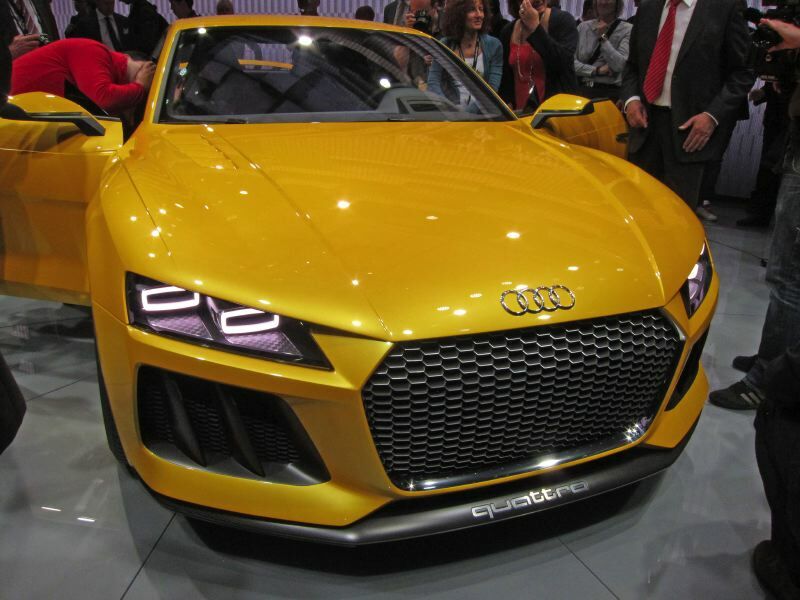 While this vehicle is clearly billed as a concept, more than one journalist in the crowd was heard murmuring that the dramatic front and rear clips where likely heading to the next version of the Audi ultra sports car, the R8. 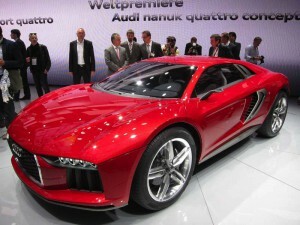 The second concept shown was the Audi Sports Quattro Concept. After a brief fling with an earlier Sports Quattro Concept in 2010, Audi ratcheted up the power and replaced the 408HP turbo-charged 5 cylinder model with a larger and more powereful model. This latest Sports Quattro Coupe is a plugin hybrid which uses both a twin turbo-charged 4.0L V8 engine as well as a 148HP/295 lb-ft electric motor to propel the speedy coupe. Total combined output from the drivetrain is 690HP and 590 lb-ft of torque. The Quattro all wheel drive system combined with the additional weight of a V8 engine, electric motor and liquid cooled lithium ion battery pack has resulted in a curb weight of 1850kgs for this latest Quattro Concept compared with 1300kgs for the 2010 version. That being said, the additional power results in a 0-100 km/hr time of 3.7sec and a top speed of 305 kms/hr. The hybrid drivetrain reportedly returns a remarkable fuel consumption rating of 2.5L per 100 kms and can travel up to 50 kilometres on electric power alone. 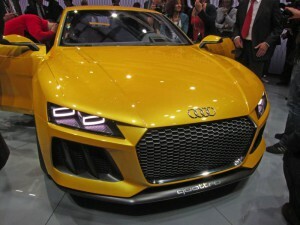 Audi officials have apparently referred to the Sports Quattro Coupe as one model destined for production. When and how much this titan will sell for remains to be seen.